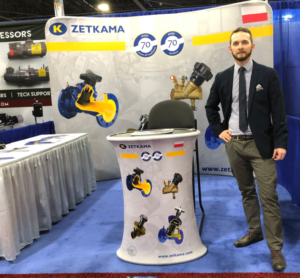 On January 14-16, 2019, ZETKAMA presented its products at the AHR Expo in Atlanta. They are one of the largest trade fairs in the HVAC industry in the USA, which have been operating since 1930. Over 2,100 exhibitors presented their products. The fair was visited by over 60,000 industry professionals from all states of America and from 165 countries around the world. The visitors had the opportunity to familiarize themselves with a wide range of products, there were presented over 770 different types of products from the HVAC industry.